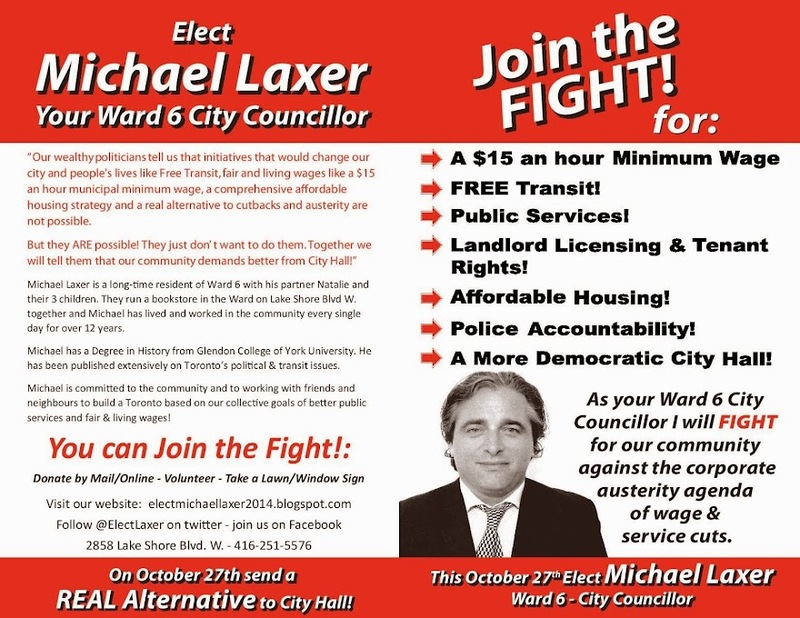 Elect Michael Laxer - Ward 6 City Councillor 2014: Join Michael for a Coffee, Tea & Discussion! Join Michael for a Coffee, Tea & Discussion! We are campaigning hard right up to election day for living wages, defending public services, fare free transit, tenant rights and landlord licensing, affordable housing, democratic reform, police accountability and a platform centred around social and economic justice for our community. Michael will be canvassing between now and Monday but will also be at the campaign office between 2-4 p.m. Saturday and 12-4 on Sunday to talk to anyone who would like to meet him, has any last minute questions or who would like to discuss issues or concerns they have in our neighbourhood or the city. So drop by for a coffee or tea and a chat! When: Saturday, October 25 2-4 p.m. & Sunday October 26 12-4 p.m.
Click here for our opening campaign program! Contact Michael or Request a Sign (for after October 2) - Thanks! Michael Laxer - Your Ward 6 City Council Candidate! Michael Laxer is a long time resident of Ward 6 with his partner Natalie and their 3 children. They run a bookstore in the Ward on Lake Shore Blvd. together and Michael has lived and worked in the community every single day for over 12 years. Michael has a Degree in History from Glendon College of York University. He is a writer for the website rabble.ca where many of his articles can be found. He is a political and community activist, a two-time former candidate and former election organizer for the NDP, was a socialist candidate for Toronto City Council in 2010 and is the Chairperson of the Socialist Party of Ontario. Why Socialism?...Click Here to Find Out! The campaign is up and running...and we are now accepting donations! I need your help to get an anti-austerity agenda, that puts better public services, free transit and higher wages first, to every door in Etobicoke Lakeshore! Any resident of Ontario can donate, and is eligible for a rebate. Contributions may only be made by individuals, not corporations, businesses or unions. c/o 2858 Lake Shore Blvd. W.
Or you can donate via Paypal or credit card by using the Donate button above. Any contribution of between $25 - $300 will be eligible for a 75% rebate from the city. Contributions over $300 to a maximum of $750 are also eligible for rebates. Please email us for any further information or details regarding the rebate program. Please note that contributors who contribute over $100 will have their name and address posted on the City's website. Help me advocate for and bring to City Hall a Socialist alternative to cutbacks and austerity, an alternative that will allow us together to build a truly better Toronto. Strategic Voting: Always a Mistake! My Answers & Responses to the Ward 6 TV Debate!